Summer is a great time for kids to be outside investigating the world around them. Blowing bubbles is more than just a whole lot of fun—by engaging in this activity, your children will be building important scientific skills like observation, tool use, generating questions, reporting their discoveries to others and more. Bubbles can get pretty messy, so if you are doing this inside, make sure to have a mop handy, as well as a large open space like a cafeteria or gymnasium. If you are doing the activity outside, try to do it on a day when there is no wind blowing, or find a spot where you are sheltered from any wind. Make the bubble solution – Mix 1 cup of dish soap per gallon of water in a bucket. After making the bubble tools, try this solution out, and see if more soap is needed. You’ll need 2 or 3 buckets for a class of 30. Make the bubble makers – Thread 3 feet of string through 2 straws, and tie the ends of the string together. 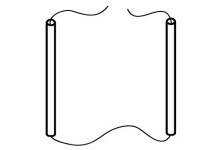 Hold a straw in each hand and pull them gently apart to make a rectangular frame. You can make these tools for your whole class, or have your students make their own (See Figure 1 for a detailed picture). Practice using the bubble maker – Place the bubble maker in the bucket of soap solution, making sure that your hands are thoroughly soapy. Touch the straws together, and while they’re still together, pull the bubble maker out of the soapy water. Gently pull the straws apart and you should see a bubble sheet in your rectangular frame. Move the frame up and down. Do you notice anything? Can you make a bubble that goes airborne with this tool? Try getting a bubble in your frame, hold it parallel to the ground at your waist, then move it up to shoulder height quickly—but not too quickly! If you touch the straws together as you reach shoulder level, the bubble will close up and fly on its own. It takes some practice—but you’ll get it! Bring the bubble makers and bubble solution buckets outside. Ask your students if they’ve blown bubbles before. What did they use to blow the bubbles? What shapes are bubbles? Are they always the same shape, or do they come in different shapes? Show them a bubble maker and demonstrate its use. Ask them to carefully observe the bubble you made. Create the biggest, longest-lasting bubble you can using your bubble makers. Divide your group of students into teams of 2. 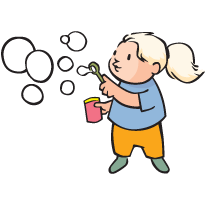 If you have the resources, and your group seems able to handle it, you can give each child a bubble maker. A second option is for you to provide 1 bubble maker per pair. The child not creating bubbles should carefully observe what they notice about the bubbles as they fly through the air, recording these observations through words and/or drawings. After one child has made a few bubbles, they should share the bubble maker with their teammate. Have students practice making bubbles with their bubble makers. It takes a lot of practice, so make sure you are moving from team to team and offering pointers to the students. After 10–15 minutes of activity, if every team has made at least 1 bubble, stop your students and bring them together to share their observations with each other. This discussion should last no more than a few minutes. What shapes were the bubbles? What else did they observe? Look for comments about a “point” on the bottom of the bubbles, colors swirling around in the bubbles, etc. Does anyone have a good technique for creating bubbles with the bubble maker? Can they share that technique with the rest of the group? Send them back to create more bubbles, and make sure that they are still carefully observing what they notice about their bubbles. Children have a natural, often uncontrollable desire to want to pop every bubble they see. This behavior is born almost entirely out of excitement, but try to encourage your students to not pop the bubbles, especially if it’s one that another child has made. The goal of this activity is for children to become adept observers, and a short-lived bubble makes that goal harder to reach. You can blow bubbles inside on tables using straws, plastic orange juice concentrate containers with the bottoms cut out—and pretty much anything else you can blow into. 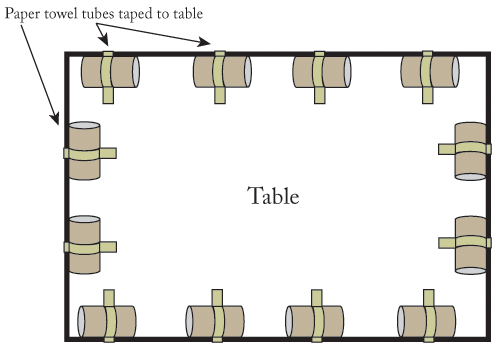 Tape down some blocks, paper towel tubes or foam rods on top of the tables, around the very edge to create a raised “lip” (See Figure 2). 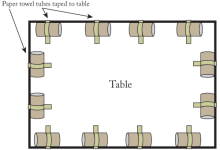 Lay a large plastic drop cloth across the table. The blocks, tubes or rods will create a lip under the drop cloth so that bubble juice won’t spill onto the floor. As a precaution, you should still place newspaper or another drop cloth on the floor around the tables. Make sure that you purchase enough drop cloths for each table, and that the cloths are at least “4 mil” sized. The thicker the cloth, the better protection you’ll have against it ripping and having bubble solution seep onto the table or the floor. You can now place small bowls or jars with bubble solution on the tables, along with bubble-blowing tools, and challenge your kids to create bubbles on the tables. How big a bubble can they make? How might they measure it? How many tiny bubbles can they make? What happens when these bubbles touch each other? Can they blow a bubble inside another bubble? Try this activity year-round! Try the Bubble Shapes activity in this curriculum after you have played with bubbles.